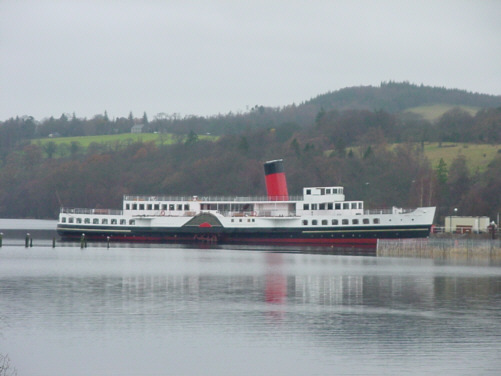 This is a picture of the Maid of the Loch paddle steamer situated at LochLomond. 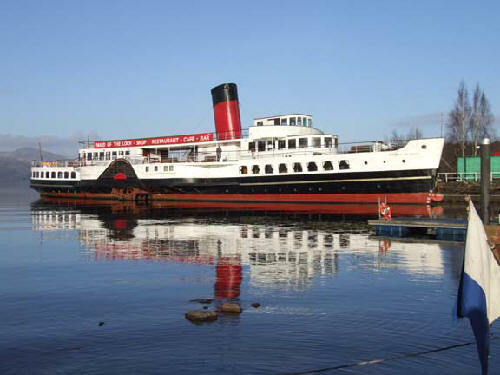 The Maid was taken over as a renovation project by the Loch Lomond Steamship Company in 1992. The group of volunteers have successfully turned the rusting hulk into the fine steamship you see in the picture below. The above picture was taken by Dougie Wood, who is one of the volunteers on the project. Below is an older picture of the paddle steamer Maid of the Loch which is presently moored near to Lomond Shores Visitor attraction. The steamer was built in 1953 by AJ Inglis of Pointhouse, Glasgow and was taken in sections to Balloch and constructed on her purpose-built slipway, and launched into Loch Lomond. Owned by British Railways, the steamer's existence was constantly under review and among the criticism was that it was too big, top heavy, over-crewed etc. Eventually in 1981 she was laid up, and left to rot until a group of enthusiasts took over in 1992 (as outlined above).